Last year, for the first time, electronic musical instruments outsold acoustic ones. Turn on a radio or television, and it's impossible to miss the change that is happening in the musical world: The electronic chip and the computer are joining the violin, piano, and guitar in the ranks of serious musical instruments. While some would rather ignore its presence, many musicians are embracing the technology that provides them with a new tool for composing, recording, and playing music. In 1983, Americans bought more than 233,000 pianos and 392,000 digital keyboards. Two years later, piano sales had declined by almost half, while the demand for their electronic counterparts more than doubled. Last year, electronic keyboard sales topped two million. Of the $3 billion spent on musical instruments in 1987, more than half went for the purchase of electric or electronic instruments. Digital keyboards, electric guitars, electronic violins, drum machines, synthesizers, and sound samplers are being connected together and controlled by computers to create new sounds impossible to play on traditional instruments. In addition to creating new sounds, computers can bend, shape, compress, and stretch musical notes to imitate traditional instruments or whole orchestras in ways never imagined by musicians just a few years ago. Jon Appleton, professor of music at Dartmouth College, is not surprised by the shift in popularity from traditional acoustic instruments to electronic ones. "Digital instruments are the folk instruments of our time," he says. "That's what people are making music on today." Some critics contend that computers cannot make music, arguing that electronic parts and components produce an unnatural or artificial sound. In the past, musicians made music by four basic methods: striking an object (piano or drum), rubbing two items together (violin or cello), blowing air through an object (trumpet or bagpipe), or plucking a string (guitar or harpsichord). Today, these methods have been extended vastly by digital technology. When sound is recorded on a compact disc or digital tape, audible vibrations enter a microphone and are converted into numbers (digits). These numbers can be stored and played back without being affected by dust, warpage, or other problems that can plague conventional analog recordings. Once stored, the digits can be processed, and that's what a computer does best. A computer can change the pitch, adjust the volume, or manipulate the waveform of the sound in dozens of ways, depending on its programmed instructions. 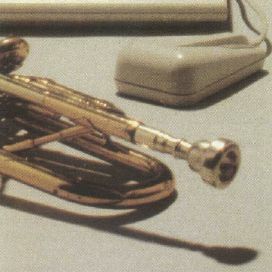 Computers such as the Commodore 64 and the Apple IIGS have internal sound chips that lend themselves well to musical applications, but most personal computers can be used to control external digital musical instruments. This was made possible by the introduction of MIDI. 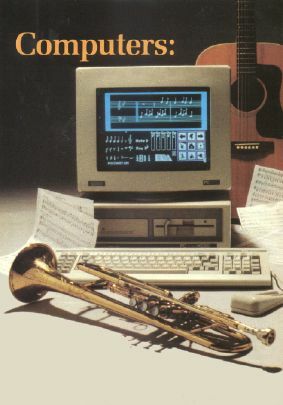 In the early 1980s, the giants of the electronic music industry got together to develop a standard that would enable digital musical instruments to exchange data. The hardware and software specifications the manufacturers agreed upon is called MIDI (Musical Instrument Digital Interface). This standard, released in August 1983, enabled musicians to control multiple synthesizers, sequencers, and sound samplers, all made by different manufacturers, from a single control unit. Previously, if you wanted to play something on an Oberheim keyboard, a Yamaha synthesizer, and a Roland drum machine, you needed an extra set of hands or more musicians. It was impossible to connect instruments made by various manufacturers in any productive manner. With MIDI, it's now possible to play up to 16 different synthesizers or drum machines from one controller or keyboard. This standard has permitted digital music to evolve at a tremendous rate. If the major computer makers showed such cooperation, you would be able write a program on your IBM, save it to disk, and then run it on a friend's Atari. While MIDI was not developed with personal computers in mind, their processing capabilities make them ideal controllers for digital instruments. Software and hardware manufacturers jumped on the MIDI bandwagon, and, before long, interfaces and programs for IBM, Commodore, Atari, and Apple were on the market. Now there are hundreds of programs for sequencers, samplers, controllers, librarians, and printers designed for the amateur musician and for the seasoned professional. Using such a system allows one musician to compose, record, edit, and play multiple-voiced compositions that can sound like traditional instruments or have electronic voices never heard before. Professional artists, impressed with MIDI'S creative flexiblity, push the technology to new limits. Peter Gabriel recently contacted Frank Foster, president of Hybrid Arts, which is a major supplier of MIDI software for Atari. Gabriel was impressed with the Atari ST, which has a built-in MIDI port, and he recently added one to his studio. Foster says Gabriel was particularly interested in Hybrid's Android programs, which can supply a musician with hundreds of new sounds. Each week Jan Hammer composes and records the music for Miami Vice at his home studio in New York. An IBM PC XT helps Hammer control an array of synthesizers and digital instruments. Philip Glass, Frank Zappa, Pat Metheny, Mike Pinder, Stevie Wonder, and Herbie Hancock are just a few of the musicians who have turned their talents to digital technology. While the professionals have a wide range of powerful (and expensive) equipment at their disposal, the amateur musician or computer hobbyist can still assemble a sophisticated MIDI system for a modest cost. The Casio CZ-101 and the Yamaha DX-100 are two popular MIDI-equipped keyboards priced at $499 and $445, respectively, but which can be found discounted to about half those prices. On the other end of the price scale is New England Digital's Synclavier Digital Music System. This top-of-the-line instrument—chosen by Stevie Wonder, Frank Zappa, Sting, Leonard Bernstein, and Chick Corea—stores, records, reproduces, or synthesizes sounds instantly at the touch of a button. As many as 304 different sound effects can be active on the keyboard at one time. Prices begin at $60,000, but more sophisticated models are priced a few dollars higher. Last year, New England Digital donated a $500,000 Synclavier to Dartmouth College's Bregman Electronic Music Studio. The studio was created in 1968 when computer wizard John Kemeny, father of the BASIC programming language, was president of the college. The Synclavier is the center of one of the most advanced music instruction studios of its kind in the United States. "Apple Computers donated a Macintosh Plus for each of 16 student workstations," says Professor Appleton, co-director of the studio, "but Apple is upgrading the gift to Macintosh IIs." Appleton, who pioneered work on the digital synthesizer with an engineer at Dart-mouth and a student who later formed New England Digital, is himself a programmer and an electronic composer with more than 30 compositions recorded on Folkways and Flying Dutchman labels. He formed the class around the Synclavier and the Macintoshes to teach students about music made with computers and digital devices and how to compose on them. Students have complete control of the Synclavier from their workstations, which are equipped with the Mac II and a Casio CZ-1 MIDI keyboard. Compositions can be played or edited instantly using the Synclavier's synthesized or sampled sounds. The results can be heard, but more importantly, the other students can use their monitors to see what is happening. Professor Jon Appleton and students analyze a violin's waveform during a session of Dartmouth College's Electro-Acoustic Music Program. "Any of the 16 terminals may be designated as the master terminal, thereby enabling any of the other 15 to see exactly what the master is doing," Appleton says. "They can very rapidly move through different programs and types of music and see what everybody's done instead of having to call up one program at a time and have people huddle around one terminal." Music students and computer students work together at Dartmouth. The goal of the computer science students is to develop the software that will make it as easy as possible for the musicians to access the synthesizer's capabilities. "More often than not," Appleton says, "musicians are not used to working with computers. It's important to develop a front end for the (Synclavier) system which is user-friendly in the best sense of the word—not simple, but one that takes into consideration the way musicians approach computers." Appleton's goal is to train young composers and to introduce them to computer systems that are flexible. A professional system such as the Synclavier is powerful but very complex. The undergraduates at Dartmouth work with engineers at New England Digital to produce software that will enable a composer to use the Synclavier's power without having to devote most of his energy trying to master the system. When a composer has an idea or an elusive piece of melody that he or she wants to capture, the ideal workstation would be nearly invisible. 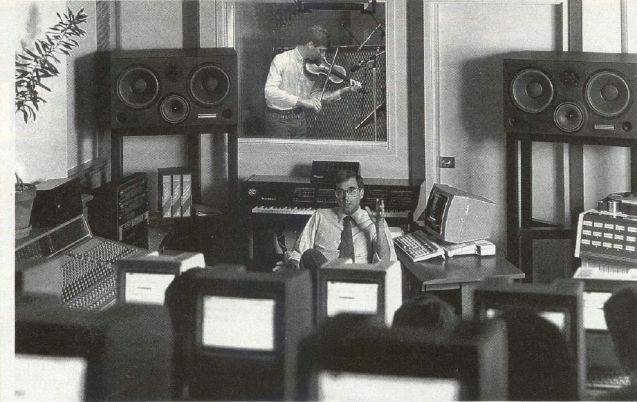 It would allow the composer to move through the various computer tasks instantly, so his or her energy could be devoted to composing or performing. "It doesn't really matter what instrument a person plays," Appleton says. "There are very effective MIDI interfaces for keyboards, guitars, and wind instruments. If a traditionally-trained musician comes to such a system, he should be able to generate what we call note lists in the manner most comfortable for him and not have to type in code." Digitized music is here and its impact on music is expected to be even greater in the future. Synthesizers and electric guitars are the instruments of our times and the instruments most played by young musicians. Appletons feels young people are approaching music with a more playful and inventive bent. Whether they play a traditional instrument or a modern one, the computer and a MIDI interface are tools to help them create music, record it, and play it back flawlessly, enabling them to realize their musical potential more easily. In addition to being a tool that can free musicians from mechanical chores that stand in the way of producing music, computers with built-in voices are themselves used as musical instruments. If music is defined as a series of pleasing or harmonious sounds, then the determination of what is pleasing lies in the ear of the beholder. Lorne Strider is one musician who turned to a computer and liked what he heard. Strider is an accomplished classical guitarist who once vowed that he had no need for a computer. He practiced his guitar in the evening, performed occasional concerts with another guitarist, and made a living selling real estate. When he decided a computer could help his business, he bought a Commodore 64. His music was never the same. Fascinated by the 64's SID (Sound Interface Device) chip, Strider tried a variety of programs, looking for ones to demonstrate the computer's capacity for reproducing music. "I started ordering any music disks that came on the market," Strider says. "Eventually, I realized that none of them involved much effort or art." Disappointed by the commercial programs he found, Strider took up programming as a hobby. He spent his evenings at the keyboard trying to coax Bach's fugues and Mozart's sonatas from his computer. His guitar gathered dust. 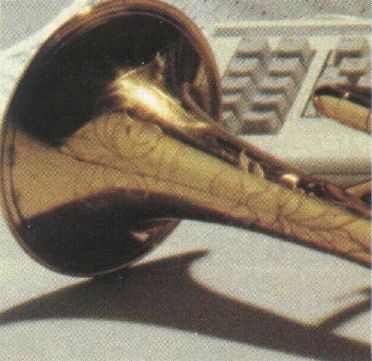 Strider's musical efforts succeeded, and he thought others might enjoy listening to classical music played on a computer. Ever the entrepeneur—he once proposed opening a branch of his real estate office on the moon—Strider launched a new enterprise called Strider's Computer Classics. He programs the works of master composers on disks that play through the computer's three voices. Strider now has ten disks that range from Renaissance music of the 1500s, through Mozart, Bach, and Clementi, to the turn-of-the-century ragtime sounds of Scott Joplin. The disks, which sell for $9.95, contain 7—15 selections and provide up to an hour of music. Each musical selection has four screens of information about the composer, his life, and his music. Strider does the historical research as well as the musical programming. For example, the disks of J. S. Bach's Two-Part Inventions, Three-Part Inventions, and Well-Tempered Clavier each contain 15 selections and a total of 60 screens of text. The real-estate broker and musicologist is somewhat surprised to find himself a software developer, albeit not one of the big guns of the industry. "It took me two or three months to design the basic structure of the disk," he says, "but once that was worked out, all I have to do is write the music files, then change the text and menus." His latest disks take about a week to complete. They are available from several distributors, including Free Spirit Software. Strider, who calls himself more of a "whacker" than a "hacker" when it comes to programming, credits Jeff Johnson's Virtuoso 64 for helping him with the mechanical chores of creating music on a computer. The software produces code that can be used to create sound effects or background music for any type of BASIC or machine language program. "It's a no-frills music processing utility, but it is very powerful," he says, "and it serves its purpose completely." Virtuoso 64 is distributed through Chipmunk Software. Strider is content with his new form of musical expression, but his former partner, Paul Brower, was disappointed when the guitar duo disbanded. Brower, who is a bit derisive about computer music, found a cartoon and sent it to his former musical partner. It shows a concert stage with two musicians bowing to the applause of the audience. One musician is holding a classical guitar, while the other holds a computer. Brower added a caption that reads, "Paul and Lorne go on tour again."